Forex is one of the trading instruments in binary options that attracts a lot of traders' interest because of the high level of liquidity. Binary options themselves are widely known as one alternative by many forex traders who want to trade more easily. One of the most popular pairs to trade on the forex market, EUR / USD, is the type of instrument that has the best trading conditions in binary options. This is evident from the opening of access to this type of trading which generally cannot be used if using other pairs other than EUR / USD. The situation is not surprising, because EUR / USD is proven as a pair that takes the largest portion of trading in forex trading. Not only because of its high liquidity, but also its movements that are not too passive but not too volatile. At any time, many traders make transactions with EUR / USD on the forex market and hope to benefit from price movements in this pair. Then, what about trading EUR / USD in binary options? Not much different from the way to trade on spot forex, trading EUR / USD on binary options is also done by estimating whether the price will move to a higher or lower level of the current price. 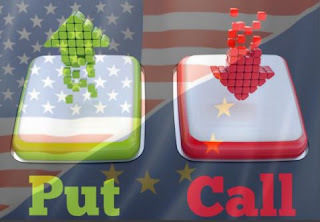 However, due to several differences such as setting expiry time before the option is placed, or the absence of a stop order feature that serves to anticipate losses, binary options traders need to take into account EUR / USD price movements more closely if they want to profit from their trading activities. This doesn't necessarily make trading with EUR / USD even more complicated in binary options. 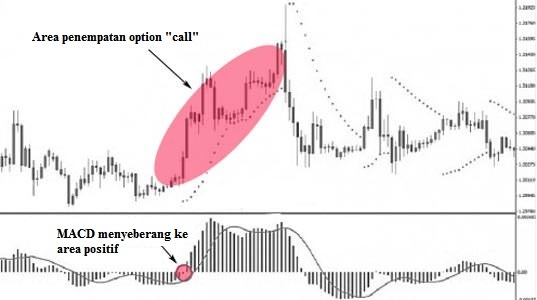 There are many special features that can facilitate trading if it can be used properly, such as variations in trading types and trading options with flexible expiry time variations. The variation in the types of trading available in binary options makes trading easier. You not only have to estimate the strike price in a position higher or lower than the current price with the type high / low, but you can also use touch options or boundary options. You can use Touch / No Touch to set a price target that will be touched or not touched before the expiry time of your option runs out. This type of trading is easier because the target only needs to be touched or untouched so that your option is said to be successful. Meanwhile, In / out of boundary can be utilized if you believe prices will be in (out) or out (out) of a range. This type of trading allows you to be able to determine targets more flexibly. In trading with EUR / USD, you can adjust the use of trading types according to market conditions and price volatility of EUR / USD. As one of the most basic types of trading in binary options, there are several ways you can do to improve your trading with high / low options. In trading with EUR / USD, prices tend to breakout when there are important fundamental data releases. If there are no other fundamental factors that can affect the movement of EUR / USD, then the price will be in a trending condition. When trading signals indicate a potential breakout, you are certainly prepared to take advantage by trading in the direction of price movements which generally will form a trend in one direction after the breakout occurs. Herein lies the advantage of using high / low options, because you can choose "high" or "call" to predict the price breakout upwards, and also "low" or "put" if you expect the price to breakout through support. Anticipating the occurrence of breakouts is not an easy thing, but when this happens, you can get the direction of price movements more clearly because prices tend to strengthen in one direction. You can use this condition to place options with high / low trading types. In the example chart above, it appears that the price breakout that occurs after the price has broken the support level reflects a strong bearish trend. The biggest opportunity is certainly at the beginning of the breakout, because expiry time can be determined more freely. But it's also good if you wait for me to confirm the breakout by observing the price action formed in the support area or waiting for some candles to form after the first candle penetrates the support level. In this way, your "put" option will be confirmed because the strengthening of the trend that occurs after the price breakout generally takes a long time and is convincingly formed. If you don't have the opportunity to enter at the beginning of the trend formation, you can also place high / low options in accordance with the ongoing trend. 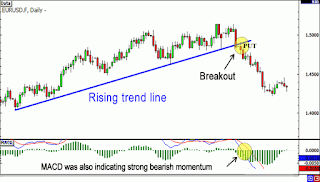 Analyzing the movement of EUR / USD that is trending can be done by utilizing technical indicators. An example of a trading chart setup below shows the use of the Parabolic SAR trend indicator with the MACD combination. Uptrend on the EUR / USD chart above is confirmed when the Parabolic SAR point is below the price and MACD moves up from the minus level to the positive area. From the bullish trend condition there are many opportunities to place the "call" option when the parabolic SAR point is still below the candlestick, which indicates a continuation of the bullish trend. A new exit signal appears when the Parabolic SAR point moves up, and the signal line crosses the MACD area. Even in binary options you cannot manually close the option position that is already placed, you can use the Early Closure feature if your broker binary options provide the facility. This step is effective to prevent losses if your expiry time will not end when the indicator has signaled a trend reversal. In addition to the breakout and trend movements, EUR / USD also has sideways movements. Trading at sideways price conditions can provide the stability needed to simplify your trading analysis. In the discussion about the type of trading boundary options, it has been explained that this option provides the most appropriate solution to support trading quality when the market conditions are sideways. Boundary options allow you to define the upper and lower bounds as the target range that needs to be reached when the expiry times arrive. By relying on sideways trading techniques you can determine price limits that are not expected to be able to be passed by price movements in a certain period of time. If your analysis has been able to provide a convincing picture of support and resistance as in the picture above, you can choose the boundary "in" option to estimate that in the future the price will not be able to move beyond the range of the range. The upper limit can be determined according to the resistance, while the lower limit can be adjusted to the support level. Touch options are very effective if used in volatile market conditions, where price movements experience a surge in volatility and prices do not indicate a definite direction of movement. By choosing the "touch" option, you can specify a specific price target so that it can be touched before your expiry time is up. Even though the price target is only touched once, your option will still end in-the-money even though the option is closed when the price is in the opposite position to your target price level. In the graph above shows that EUR / USD shows the volatility of price movements for 2 days. If you want to place an option at 6 pm with daily expiry time, you may feel confused to determine the direction of the next price movement, whether to form a new trend or move within the narrow range. In situations like this you can choose the "touch" option to help your trading binary options. You can choose the "touch" option and specify the price target that will be touched at the 1.2980 level. When your option closes at the same time the next day, your option can be said to be successful because the price touched that level, even when your option is closed the price is above the 1.3000 level. If you like trading in calmer market conditions with price movements that tend to be sideways, you can choose the type of trading in / out of boundary (boundary options). But if you trade when EUR / USD is experiencing high volatility with erratic price movements, touch / no touch (touch options) can be the right type of trading for you. Expiry time is a special feature of binary options that allows you to set your own closing time of an option. Expiry time usage is generally related to how you trade. For short-term traders, expiry time may be determined at the hour to minute level. Trading with a method like this can take advantage of EUR / USD characteristics in each session to be able to use binary options trading types accordingly. For example, in the Tokyo session the movement of EUR / USD usually tends to be flat because of the lack of release of important fundamental data that can significantly affect the movement of EUR / USD. Thus, you can use a sideways strategy and choose the type of trading boundary options to maximize your trading opportunities. Conversely, at the start of the London session which is generally accompanied by a EUR / USD breakout in a certain direction, you can choose to use a breakout strategy and execute your options with high / low options. As for trading in the New York session, traders can choose touch options to anticipate the volatility of the EUR / USD movement which tends to increase, especially when there is an overlap between the London and New York sessions. On the other hand, long-term traders generally prefer to choose expiry time daily, weekly, and monthly. This type of trader generally performs a deeper fundamental analysis by utilizing technical indicators and analysis on a lower timeframe to find entry positions. EUR / USD traders will generally find it easier to get additional information from external sources because of the large amount of financial media that looks at the fundamental situation of the US and Eurozone economies. Increasing the chances of successful trading with EUR / USD is actually easy. You only need to take advantage of the characteristics of this pair movement and the facilities provided by brokers to maximize trading results. Variations in trading types, expiry time options, early closure features are some examples of binary options broker services that can support your EUR / USD trading. Besides being equipped with complete analytical material, trading EUR / USD on binary options can allow you to process trading planning with a more flexible and profitable method.